Feel the power of the puff! Resilient balls feature easy-to-grasp strands. Easy to grab with a great "gooey" feel. Perfect for tactile hand therapy or a stress reliever. 4-3/4". Assorted colors. Latex Free. Set of 6. Resilient, super soft balls with easy-to-grasp strands have a soothing, squishy texture. 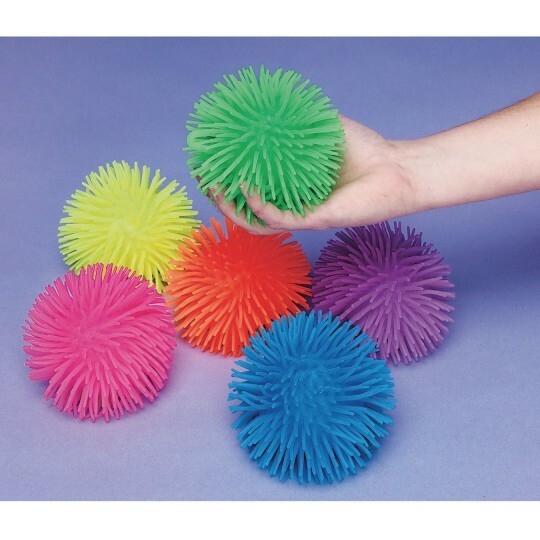 Great tactile hand therapy and stress reliever. 4-3/4". Assorted colors. Set of 6.
used with less than mobile seniors who had a BLAST tossing them to each other and also used them with a basketball hoop waste basket. Great fun and good exercise. Puffer Balls are great for all our residents. The feel the bounce squish and the toss. Many ways to play with them- And sturdy-we squeeze and pull them in all different ways for action. Perfect for my special needs folks!!! I connected them to my residents wheel chair so they wouldn't drop them..
We use them for the residents to fidget with and toss to each other.